Well, yes today, after months of hype, expectation, and everything else, they finally got around to announcing who would would be the (unlucky?) 13th person to portray Dr Who on TV, in said TV series. Well, today, finally, after today, not only will the Doctor get to regenerate yet again, but this time around, the good Doctor is going to discover that deal includes some gender reassignment too! One unique claim I can currently make is that I’ve seen at least 1 episode of every actor to play the Doctor (one only made 1 appearance) so far, so yes, I suspect at Christmas, I’ll be watching the new one, to see what I think, and to get her reaction to the dramatic change, which should be fun! My favorite (easily) of the new group would have to be Tennant, and of the original group, Pertwee, and Tom Baker would probably be the ones. Right, the video. Nothing very original, though the tribute was out of date, even before now, as no Capaldi in it. Author stevielounicksPosted on July 16, 2017 Categories Cybermen, Dr Who, Jodie Whittaker, TimelordsLeave a comment on Who’s the Doctor? Looks like I’ve been upgraded! Oh believe me, I wish that was for real! Mind, if anyone out there reading this is saying, it can be easily done, or even trickily done, then yes please, I’d love it to happen! Feel free to shout, if you can! So, tell a short story, last weekend, I decided I hadnt done any selfies in quite a while, so thought I’d give it a go. I did do a few at Christmas, but they werent great, so that means the last decent ones were in Hollywood, last October. This time though, I decided to have a bit of fun, and play up the whole robot look, while doing it. Yes, it would be a lot easier if someone else was taking the photos, especially while wearing the helmet, as you really cant see a lot, wearing that, so if anyone wants to take a few for me like that (I have no funds to pay for lots of expensive photos) for whatever reason, then again, shout. 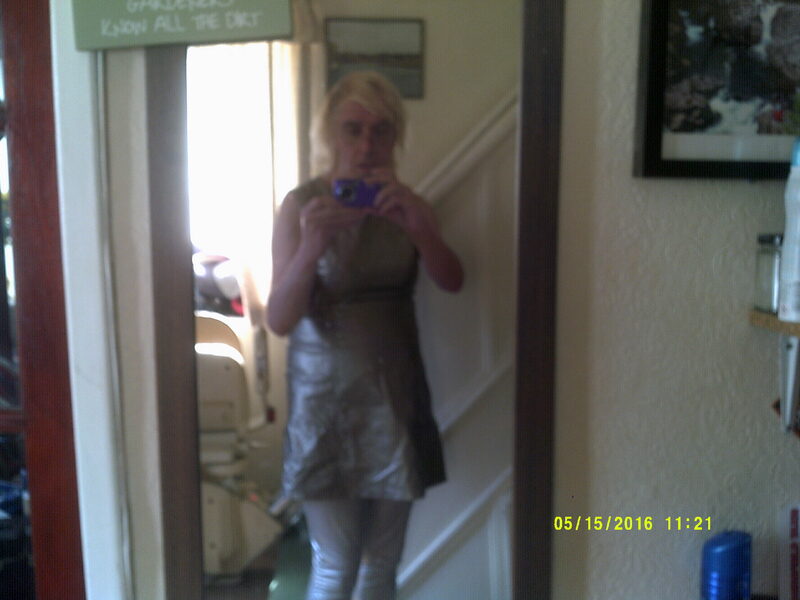 Or ideally, if someone wants to genuinely turn me into a robot, oh please do! Right, the video. A tribute to the most famous robot ever, just maybe? Yes, fine, maybe I should have gone with the original, Debbie isnt as strong a singer as she used to be, sadly. Hardly surprising, at her age, but anyway, who am I to talk? 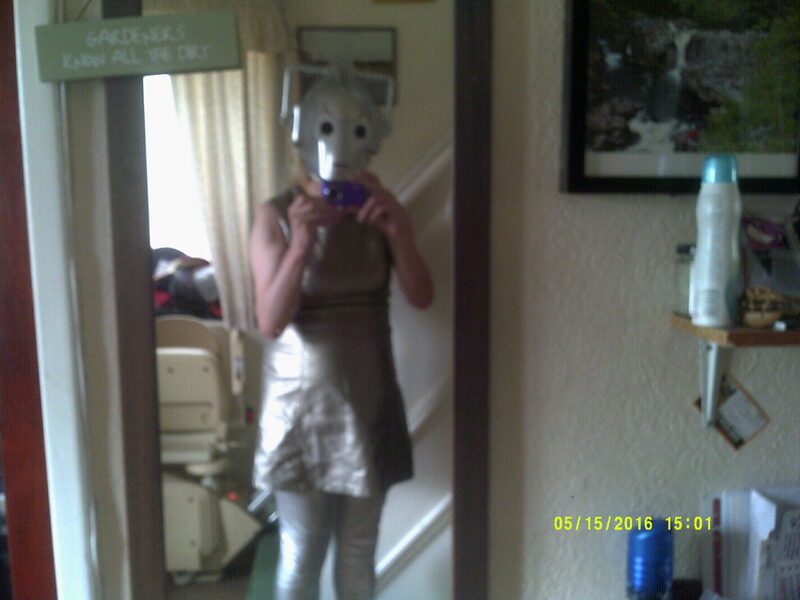 Author stevielounicksPosted on May 21, 2016 Categories Blonde, Cybermen, Cybernetic Enhancement, Photo shoot, photography, robot, robot suit, Robotisation, Silver clothingLeave a comment on Looks like I’ve been upgraded! Is it an age thing, or just the long distance travelling? Its funny, I never used to get bothered by the time and distance involved in travelling to the west coast of the US, but I’m beginning to notice just how much tougher this long distance travel is getting of late. It might be an age thing, certainly the old body doesnt seem to enjoy being confined to a plane seat for long periods now, and I’ve noticed that on 2 trips to the east coast this year, Toronto and Boston! I suspect the monotony of the flight plays a part as well, but I know my legs have been complaining this time around, even with decent legroom. So I’ve pretty much decided that its time this middle aged lady eased off a bit, and I’ve decided I’m going to cut out the west coast trips…after the next one that is! Chicago/Minneapolis, and a sort of line there on will then be the limit, at least until the body disintegrates some more, or I get an upgrade lol! So where is the one place left to go to, before I retreat, why Seattle of course! Its funny, I’d never even seen Seattle until 2003 (I nearly said my age, but thats something a lady shouldnt do, lol!) but instantly fell in love with the place. Maybe it was the climate, maybe it was the people, most likely a combination of both. I was fortunate enough to spend a good period of time out there then, and loved every minute of it, even if the budget was a bit tight at times! I was also lucky enough to go back a few years later for a week, when the budget wasnt as much of a concern! And yes, I still loved the place. So unsurprisingly, I want to go back one more time before the old body screams enough, and see the city again. It will be funny knowing its probably for the last time (both times previously I knew I would be back), but I’m fast approaching my mid fifties, and the body is beginning to wear out a bit, and travelling that far is becoming a struggle. And alright, I want to see the Mariners play at some point too! Next autumn will be east coast, thats for sure, I’m hoping I can get at least a few more years of coping with that length of journey at least, but a lot will depend on how the body (especially the knees) hold up, I guess. 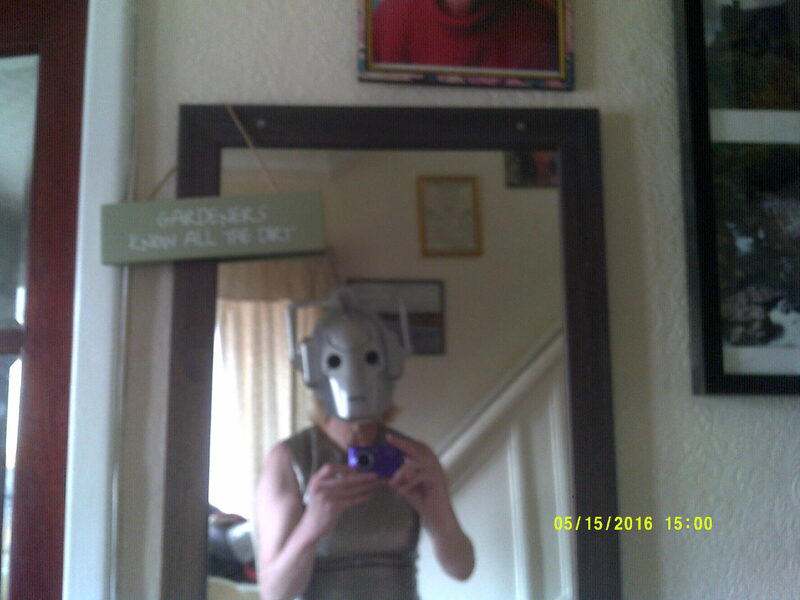 Well unless MIT, or the Cybermen can upgrade me anyway lol! Author stevielounicksPosted on September 27, 2011 Categories Boston, Cybermen, MIT, Seattle, Seattle Mariners, The Fleetwoods, Transatlantic Travel6 Comments on Is it an age thing, or just the long distance travelling?